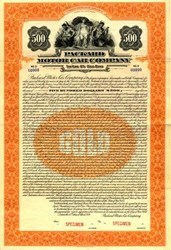 Beautiful engraved Specimen Gold Bond Certificate from the Packard Motor Car Company dated in 1921. 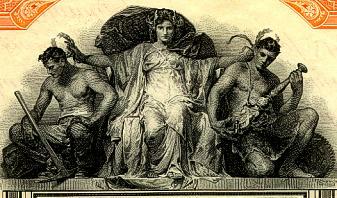 This historic document was printed by American Bank Note Company and has an ornate border around it with a vignette of a group of allegorical people. This item is over 86 years old. Minor wear on folds. Packard was founded by brothers James Ward Packard (Lehigh University Class of 1884) and William Dowd Packard in the city of Warren, Ohio . The Packards believed that they could build a better automobile and James, a mechanical engineer, had some ideas how to improve on the designs of current automobiles. By 1899, the brothers were building vehicles in their native Warren, Ohio. The company, which they called the Ohio Automobile Company, quickly introduced a number of innovations in its designs, including the modern steering wheel and the first production 12-cylinder engine. In need of more capital, the Packard brothers would find it when Henry Bourne Joy, a member of one of Detroit's oldest and wealthiest families, bought a Packard. Impressed by its reliability, he visited the Packards and soon enlisted a group of investors that included his brother-in-law, Truman Handy Newberry. On October 2, 1902, Ohio Automobile Company became Packard Motor Car Company, with James as president. Packard moved its automobile operation to Detroit soon after and Joy became general manager and later chairman of the board. One of the original Packards, if not the original, is still located at the Packard Museum in Warren, Ohio on Mahoning Avenue. The Packard's factory on East Grand Boulevard in Detroit was designed by Albert Kahn, and included the first use of reinforced concrete for industrial construction in Detroit. When opened in 1903, it was considered the most modern automobile manufacturing facility in the world and its skilled craftsmen practiced over eighty trades. The 3.5 million ft2 (325,000 m�) plant covered over 35 acres (142,000 m�) and straddled East Grand Boulevard. It was later subdivided by eighty-seven different companies. Kahn also designed The Packard Proving Grounds at Utica, Michigan.